On Tuesday, July 17th the Galveston County Health District confirmed a case of West Nile in Galveston, Texas. The 20 to 29-year-old female has recovered from the illness. This is the first confirmed case in Galveston County for 2018. GCHD has notified Galveston County Mosquito Control of the confirmed case of mosquito-borne illness so that the agency may factor that into its surveillance and spraying efforts if needed. The most recent cases of human WNV in Galveston County were six confirmed cases in 2016. Residents can call in a request for a spray through the Galveston County Mosquito Control office, who handles mosquito control for the City, at 800-842-5622. They can also visit the Galveston County Mosquito Control website, where spray schedules and hours are posted and updated daily. Use insect repellant that contains DEET, picaridin, IR3535 or products that contain oil of lemon eucalyptus and para-menthane-diol. Wear long-sleeves and long pants if you’re going to be outside for an extended period of time. Dusk through dawn is when mosquitoes are most active. Avoid going outside from dusk until dawn when mosquitoes are most active. 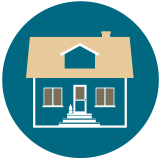 Get rid of standing water around your house or apartment – wet, murky areas are where mosquitoes tend to breed. Buckets, discarded tires, and even birdbaths are great places for mosquitoes to lay eggs. Install or repair screens on windows and doors or use air conditioning. Most people infected with WNV do not have symptoms. About one in five people who are infected develop a fever and other symptoms including a headache, body aches, joint pains, vomiting, diarrhea or rash. Most people with WNV recover completely, but fatigue and weakness can last for weeks or months. About one out of 150 infected people develop a serious, sometimes fatal, illness like encephalitis or meningitis (inflammation of the brain or surrounding tissues). Symptoms can include a headache, high fever, neck stiffness, disorientation, coma, tremors, seizures or paralysis. Serious illness can occur in people of any age, but those 60 years or older are at the greatest risk for severe disease, as are people with certain medical conditions including cancer, diabetes, hypertension, kidney disease and organ transplant recipients. Anyone who experiences symptoms should contact their healthcare provider. For more information on WNV, visit the Centers for Disease Control West Nile page. Please visit the Galveston County website dedicated to mosquito control. Monday-Friday, 8:00 p.m. to 4:30 a.m.
For questions or concerns email Galveston Mosquito Control. View The Press Release From Galveston County Health District Regarding Confirmed Case In Galveston. Access the CDC's information on West Nile Virus. West Nile is a mosquito-borne virus first discovered in the United States in 1999. The first reported illness was found in New York City. The virus has the ability to infect people, mosquitoes, certain types of birds, horses and other animals. Not all species of mosquitoes carry the virus. West Nile is spread by the bite of an infected mosquito. When a mosquito bites an infected bird with the West Nile virus, the virus enters the mosquito's bloodstream and circulates for a few days before settling in the salivary glands. When the infected mosquito bites and animal or a human, the virus then enters the host’s bloodstream where it may cause serious illness. 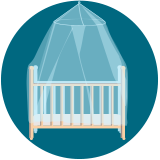 The incubation period; period between when you are bitten by an infected mosquito and the appearance of signs and symptoms of illness, ranges from 2 to 14 days. The virus is not spread through person to person contact or animal to animal contact. Following transmission by an infected mosquito, West Nile virus multiplies in the person’s blood system and crosses the blood-brain barrier to reach the brain. The virus interferes with normal central nervous system functioning and causes inflammation of brain tissues. West Nile has 3 different effects on humans. The first is asymptomatic. This means the infected individual shows no symptoms of infection. Most people infected with the West Nile virus fit into this category. The second stage is West Nile Fever. Only 20% develop symptoms that include fever, fatigue, skin rash, diarrhea, nausea, headache, vomiting, swollen lymph glands, and muscle or joint pains. These symptoms can last a few days to several weeks. The third and more severe category is West Nile encephalitis or West Nile Meningitis. Less than 1 percent of infected people will develop a more serious illness with symptoms that include headache, high fever, stiff neck, disorientation, convulsions, tremors, muscle weakness, lack of coordination, pain, and coma. Severe cases of the virus may lead to paralysis, coma, or death. Even if you are infected your risk of developing a serious West Nile virus related illness is extremely small. Most people who do become sick recover fully. Symptoms normally begin to appear 3 to 15 days after the mosquito bite occurs. People age 50 and older or people with weak immune systems are more likely to develop severe symptoms from the West Nile virus. There is no specific treatment for a West Nile infection. In serious cases treatment may involve hospitalization where patients can receive supportive treatment including intravenous fluids, respiratory support, prevention of secondary infections, and nursing care. Currently there is no vaccine to protect humans from West Nile. The best defense against disease is to control mosquito populations, monitor for the presence of the virus, and prevent mosquito bites. Use Environmental Protection Agency (EPA)-registered insect repellents with one of the active ingredients below. When used as directed, EPA-registered insect repellents are proven safe and effective, even for pregnant and breastfeeding women. Find the insect repellent that’s right for you by using EPA’s search tool. Always follow instructions when applying insect repellent to children. Do not use products containing oil of lemon eucalyptus (OLE) or para-menthane-diol (PMD) on children under 3 years old. We do not know the effectiveness of non-EPA registered insect repellents, including some natural repellents. To protect yourself against diseases spread by mosquitoes, CDC and EPA recommend using an EPA-registered insect repellent. 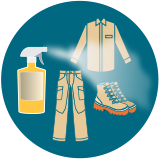 Choosing an EPA-registered repellent ensures the EPA has evaluated the product for effectiveness. Visit the EPA website to learn more . Treat items, such as boots, pants, socks, and tents, with permethrin* or buy permethrin-treated clothing and gear. Permethrin-treated clothing will protect you after multiple washings. See product information to find out how long the protection will last. If treating items yourself, follow the product instructions. Do not use permethrin products directly on skin. *In some places, such as Puerto Rico, where permethrin products have been used for years in mosquito control efforts, mosquitoes have become resistant to it. In areas with high levels of resistance, use of permethrin is not likely to be effective.